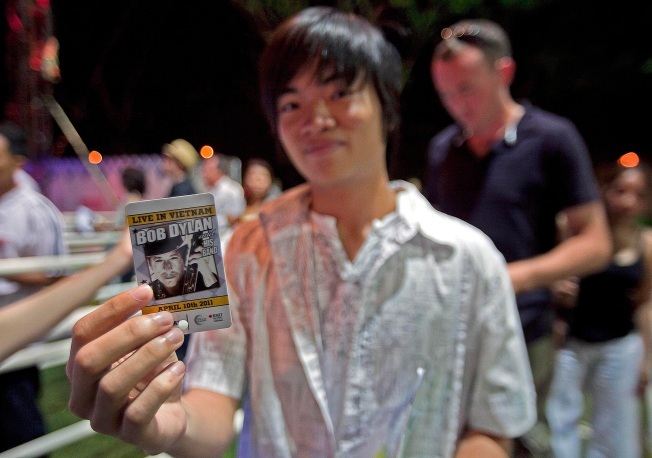 Bob Dylan performed one night only at Ho Chi Minh City, seeing the city at peace. Bob Dylan, the anti-war icon whose songs fanned the flames of protest during the Vietnam war, finally got to see Saigon on Sunday. But it's not Saigon anymore. It's Ho Chi Minh City, and instead of guns and smoke, there were bare feet in the grass and tunes in the evening breeze as Dylan, 69, sang to a crowd of about 4,000 people at RMIT University. A high percentage of Vietnam's population is under the age of 30, so there are many people who don't remember what it was like during Dylan's zenith. Still, Tran Long An, 67, vice president of the Vietnam Composers' Association, told Salon that it wasn't just in America that people were touched by his message of peace and tolerance. "Bob Dylan's music opened up a path where music was used as a weapon to oppose the war in Vietnam," he said. "That was the big thing that he has done for music." Dylan also stopped in China last week for a controversial concert where he left out some popular songs with revolutionary undertones, including "Blowin' in the Wind" and "The Times They Are a-Changin.'" The omission prompted Maureen Dowd and human rights groups to accuse Dylan of allowing himself to be muzzled by a brutal foreign government. Brad Adams, executive director of the Human Rights Watch's Asia division, said, "The young Dylan wouldn't have let a government tell him what to sing."